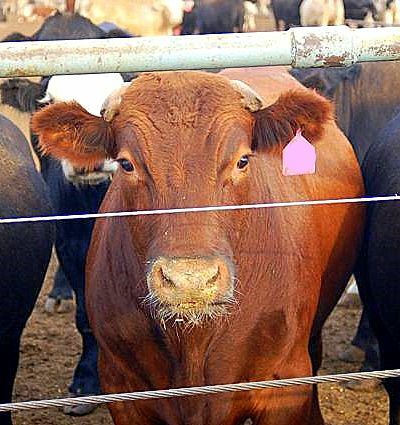 Earlier this week, Peg at Bloomfield Farms did a feature about cattle country. As I moved through her wonderful pictures I was struck by the pink tags that were placed in the ears of the cattle once they were in feedlots. My devious mind immediately knew what I would use as my lead photo today. If I led with a tagged steer, I'd need to feature a recipe for beef. So, I made a large pot roast for dinner tonight. It will provide two additional and easy meals that will allow more time for Thanksgiving preparation next week. I bake my pot roast in a low, slow oven. This recipe can be adapted for use in a slow cooker but the texture of the meat will not be the same. I, obviously, prefer the texture of the oven roast. I prepare a rub of sorts and work it into the beef with a jaccard or fork the night before I brown and roast the meat. I was born a contrarian, so I prefer to use flatter cuts of beef for our pot roasts. My favorite cuts are a boneless shoulder or center cut pot roast. Whatever cut is used, it's important that the braising liquid not cover the meat. It should come only halfway up its sides. I use white vermouth in this recipe. You can use red or white wine. My preference for vermouth is based on the fact that it's a fortified wine and can sit for a good while without turning to vinegar. A good French vermouth guarantees there'll always be a decent cooking wine in the house. That truc originally came from Julia Child. Whenever possible, I make the pot roast 24 hours before I plan to serve it. This allows neat slices of meat to be cut before they are warmed. Here's the recipe for the pot roast which, coincidentally, makes great French dip, cheese steaks or barbecued beef. 1) The night before roasting, combine garlic, rosemary, salt and pepper in a small bowl. Using a jaccard or meat fork, work the mixture into both sides of pot roast. Wrap in plastic wrap and refrigerate overnight. 2) Preheat oven to 300 degrees F. Heat oil in a Dutch oven over medium heat. When it is hot, slowly brown roast, about 10 minutes per side. Add vermouth and beef broth and bring liquid to a simmer. Cover and transfer to oven. Cook, covered, turning roast every 30 minutes, until tender and meat fork easily slips in and out of meat, 3 1/2 to 4 hours. About an hour before end of cooking time, add carrots and potatoes to Dutch oven. 3) Transfer roast and vegetables to a serving platter. Tent with foil to keep warm. Skim fat from surface of braising liquid. Add water or stock if necessary to equal about 1-1/2 cups. Combine flour and water in a lidded jar. Shake until smooth. Add to braising liquid and simmer for about 10 minutes. Season to taste with salt and pepper. 4) Using chef’s or carving knife, cut meat against grain into 1/2-inch-thick slices. Pour about 1/2 cup sauce over meat. Serve, passing remaining sauce separately. Yield: 6 servings. This sounds like another winner, Mary! I wonder what the tag is in the cow's ear. My father raised prize beef cattle, and they had silver vacination things piereced through their ears like giant earrings. I wonder if the pink tag is similar. Nothing like a good pot roast--an you have made such a gorgeous serving plate of it too. It almost looks too pretty to eat. This recipe should do well with pork too. Looks so yummy good! Clever pink tag lead-in! Recipe looks great! I am posting a Pot Roast Post tomorrow called Sunday Dinner. It is one from my MIL and really posted for my girls with step-by-step pics. This is seriously the next pot roast Id like to try, and I love how you arranged the potatoes around the meat. Now I am just shaking my head. Your Pot Roast is a thing of art! The recipe sounds delicious and I am happy to learn a little about slow cooker and oven roasted. Thank you for that and have a wonderful weekend. Thank you for sharing this. Love the "pink earings" of the cow. Happy PS to you. Love the photo of the cow and her pink tag. I just bought a roast to make a pot roast. I will try this when the family is ready for a nice pot roast. Love your blog. Sheila, the tag identifies the feedlot to which the cattle belong. Another great recipe! Thank you! So pretty! I love the presentation. And the sammies you are describing are making me hungry! Mary, nothing warms the soul like a good Pot Roast. This recipe sounds so delicious. Enjoy! Mary, Your pot roast looks so elegant, I love making this meal just for that reason, you don't have to cook for a couple more meals, I'll have to arrange my a little prettier. Happy PS. i was in colorado springs visiting my dear friends and met London, Meatball and ??. They belong to Teng Teng. London is a black and white and the oldest of the three. Meatball and ?? are still calves and brown like the one in your picture but they do not have tags. Perhaps they have but i was too engrossed in their lovely fur. Love the arrangement on this delicious dish. Whenever I drive by a field with cows with tags, I always say "Nice earrings"
What a delicious blog! Your header is delightful! I'm on my way to check out what I've been missing! Mary, there is a bit of a chill in the air -- pot roast sound wonderful -- it was one of our winter Sunday dinners growing up! This looks and sounds delicious. I like both oven and crock pot roasts but prefer the oven. What a beautiful presentation of your pot roast. I love the pink in the picture! Oh, oh, oh. Just now seeing your blog. I'm a printing recipes right now. Such a wonderful blog you have. Love your cow photo! And the pink earring. I think pot roast is better the second day too--also true with stews. Great presentation, Mary! It looks divine. We make our pot roast almost the same Mary except I have never used vermouth. I will have to try your recipe to see what flavor the vermouth adds to it. Thanks for sharing your recipe and happy Pink Saturday! Again Mary,You have made me so hungry..as always,your food and presentation is just gorgeous. Your pictures and service is just so pretty.. Happy Pinks..and have a wonderous Thanksgiving filled with all those you love. Feedlot?? Cool I didn't know that. I like the presentation, it looks delish Mary. Your comment arrived by divine intervention I am sure. Just as I was about to leave for my grocery shopping for the week, I checked here one more time. As is my usual routine, if I have not stopped in here already this week, I catch up! We adore,crave, etc. Portuguese kale soup. Immediately upon seeing the recipe to include the leftover turkey, I quickly typed kale and sausage into my iPhone list. I love your recipes and I love the technology that keeps me updated here and at the store! Thank you for the recipe! Your work is much appreciated in our home. Good thinking, Mary! Your recipe sounds delicious! Thanks for sharing and Happy Pink Saturday. A beautiful arrangement for the roast and potatoes, Mary. I prefer the oven, too for cooking, although I do use the crockpot once in a while for it. I like your tip of using a herb rub the day before you roast it- I hadn't thought of that. Thanks! Very pretty presentation. I like the oven as well and the tip about the vermouth makes a lot of sense! Oh the cow with her pink earring ! That is the most beautiful pot roast I have ever seen, after all the turkey I think I will be trying it. Pretty Pink earred steer too! Oh, Yum!!! I make pot roast with potatoes and carrots but I'm sure it's not as good as yours. I will try your recipe instead. Happy Pink Saturday! It looks and sounds delicious, but I do feel sorry for that poor cow. Even if she got a pink tag in her ear! Happy Pink Saturday and have a wonderful weekend! Would you please come cook for me? I have no idea what to make for dinner and too late to make your delectable pot roast!!!! YUM! Oh, Mary. How can I enjoy pot roast with those big brown eyes looking at me??? I know, I'm a city kid. I always love your Blog, so many pretty things and the yummy food, I write down your recipes and try them~~so delicious~thanks so much for sharing with us. see you next time, and have a wonderful Thanksgiving! ~*Happy Pink Saturday*~ and Happy Thanksgiving to you and yours!!! YUM! The pink tag is pretty but my I'm looking forward to trying your pot roast recipe! Merci for coming and visiting my blog and here's to more pink tags! We raised beef cattle, up until about 7 years ago. Happy Pink Saturday! Quite a cute pink Saturday picture! The stew recipe looks wonderful. Thanks for sharing! The roast sounds wonderful. My mouth is watering just reading the recipe. Happy Pink Saturday and have a wonderful Thanksgiving. All our cattle must be tagged so thepicture made me smile. I wanted to do a roast for Boxing day so that recipe looks fab. I'm going to have a go at that. Thanks and Happy Pink Saturday. what a great recipe thank you for sharing ...love the pink tag. Happy Pink Saturday! You are so good at cooking and making us all hungry. As always, I would like to have anything you prepare. This would sure taste good after too much turkey. At least the cows are into pink too! What a great post. Thanks for commenting on mine as well. I should never visit your blog on an empty stomach - especially as you alway have such mouth-watering, delicious looking recipes ... sigh, wish I could 'cook'. Happy ps - have a great week. Pot roast and potatoes are the perfect comfort foods for a chilly night. Looks and Sounds great! Hope you had a great pink Saturday! 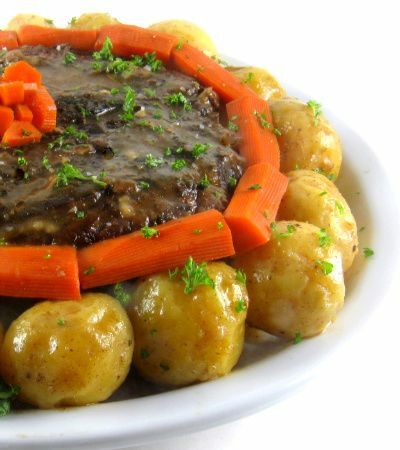 This pot roast sounds like perfection! For so long I've needed The Recipe. I think this may be it! Thanks for visiting my post and for the YUMMY Pot Roast recipe. It happened to be my FAV way to eat beef. Pa will be so happy you are encouraging people to eat beef. Great idea for Pink Saturday. Delicious sounding recipes too! To answer the ear tag question, there are several thousand cattle in a feed lot. Each one is very important to his owner. Occasionally, one might escape from a pen and steers are very closed-mouthed about where they came from. Those tags help them return to their rightful owner. Each pen is identified with the same color... Pa's bunch got stuck with the hot pink tags. The guys were not too happy with the color choice. Yummy!!! I love pot roast! Arent you clever, it looks like a crown. What a beautiful potroast and so uncommon here in Australia. The final dish sounds so delicious I might even try it later when the hot weather abates. Wonderful photos. Cheers from Audax in Australia. Cute idea for Pink Saturday. I have a hard time looking in the eyes of what I am about to eat! Love pot roast and it is a great idea to make it as a time saver while you prepare for Thanksgiving. Yummmmmm, pot roast! I haven't fixed that delicious meal for over 7 years....that's when my hubs had a heart attack! We do have a steak on occasion, but not pot roast....and I can tell you that I MISS IT! Your blog is wonderful!! Thanks for all of your interesting and delicious shares! Mary, I love your clever use of the photo. I am certain that cow was thrilled to have received a pink tag. Your pot roast looks and sounds delicious. I like that you use the vermouth, and I will try that next time. I like mine cooked in a slow oven, too. Ooh I love pot roast, especially when the fork slips easily in and out of the meat and that melt-in-the-mouth feeling when eating it. I'd love to really try this recipe. I will think about that - A good French vermouth guarantees there'll always be a decent cooking wine in the house. Wow, this looks fantastic! Not sure if I agree about the vermouth though. It may work with this recipe, but it can't work for everything (you use different spices in each recipe, so why not different wines?). Ever heard of this: www.academiewines.com? They blend nice wines for gourmet cooking - real wines, not your standard "cooking wine". Bottles are smaller too (which I like!) and you can drink while you cook (which I really like! ).